Time Magazine believes that FarmVille is as bad an invention as the hydrogen blimp. The videogame industry has made it into a feature over at Time called the "50 Worst Inventions." Joining the list alongside hydrogenated oils, chlorofluorocarbons, asbestos, sub-prime mortgages, and Crocs are are both FarmVille and the Nintendo Virtual Boy. 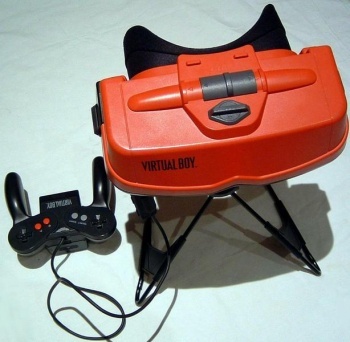 The Virtual Boy, released in 1995, was sort of what we all thought the future of entertainment would look like as a form of virtual reality goggles connected to a controller, but it didn't really feel like the future at all. The red-goggle console made the list thanks to its expensive $180 price and small 14 game library in the U.S. (22 in Japan). The Virtual Boy is best known for its monochromatic red graphical display and for making gamers feel a little woozy after playing over long long periods of time. As for FarmVille... do we really have to go into FarmVille? Time labels the game as a series of "mindless chores on a digital farm," and it'd be hard to find anyone that would disagree, even those who love the game and play on a daily basis. Assuming someone reading this hasn't heard of it, FarmVille is a game accessed through Facebook that is a series of mindless chores on a digital farm. It's gotten a bad rap with developer Zynga's CEO admitting he was a scammer, but that hasn't stopped it from becoming so popular that it's now bleeding into the real world. It looks cute and cuddly, but FarmVille was officially created by the devil, making it a worthy addition to Time's list. I would dispute that the Virtual Boy was as bad an invention as one responsible for the erosion of the Earth's ozone layer, for America's obesity epidemic, or the crash of the U.S. economy, but it was pretty unsuccessful, sure. On the other hand, Time hit the nail on the head with FarmVille. It's great to see the videogame industry getting more coverage in the mainstream press, but perhaps not as much in articles like these, which no doubt only drove more players into the trough of virtual farming.